The earliest settlers arrived on the islands around 1000 BC as descendants of the Malays of Indonesia, Melanesians of New Guinea and Polynesians. The region was first visited by Europeans in the 16th century and was made part of the Spanish East Indies in 1574, although it was more than a century before the first map of Palau was drawn. Following defeat in the 1898 Spanish-American war, Spain sold the islands to Germany, which exploited their natural resources until Palau was seized by Japan in 1914. The United States then took the islands in 1944 after the ferocious WWII Battle of Peleliu, which resulted in the deaths of more than 2,000 American and 10,000 Japanese soldiers. After liberation from Japanese occupation, Palau became part of the Trust Territory of the Pacific Islands, administered by the USA under a mandate from the UN in 1947. In 1986, the governments of Palau and the USA agreed the terms of a Compact of Free Association, which allowed for virtual independence under a US defence umbrella. The Palau Compact, however, remained unsigned, because of a crucial clause forbidding the presence of any nuclear weapons on the islands, including visits by ships equipped to carry them. The USA refused to sign the Compact until the clause was rescinded and the dispute introduced a violent aspect into Palau's politics – President Haruo Remeliik was assassinated in 1985 and his successor, Lazarus Salii, committed suicide in August 1988. At the presidential election of 1992, Kuniwo Nakamura won a narrow victory. The island was faced with a choice of accepting the Compact or seeking full independence – a hazardous proposition for economic reasons. In October 1994, the Compact was endorsed and Palau was admitted to the UN in December 1994. Nakamura served a second term between 1996 and 2000 after which he was replaced by president, Tommy Remengesau, who took office for a second four-year term in 2013. 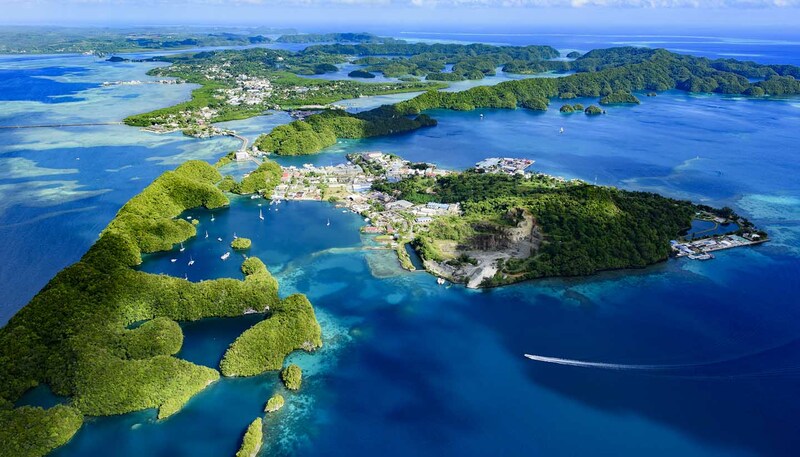 Although wealthier than many of its near neighbours, Palau wrestles with the typical problems of all Pacific islands – isolation, a lack of infrastructure and rising sea levels caused by climate change. •	The 1968 film, Hell in the Pacific, starring Lee Marvin was shot in Palau. •	Palau has a national football team, but is not part of FIFA. •	In 2012 Palau received the Future Policy Award from the World Future Council for its protection of marine ecosystems. When it comes to everyday interactions, most Palauans expect some form of salutation, and it's considered rude not to say 'hello' or 'good morning' when encountering someone. If visiting someone's home, a small gift for the host will be highly appreciated. When it comes to eating, it's considered polite to try everything you're offered and eating more will be taken as a sign of enjoyment. The practice of chewing and spitting out the red juice of the betelnut is commonplace amongst locals. Traditional Palauan society follows a complex matrilineal system that is still at play when it comes to rites of passage such as death, birth and marriages. The people are now amongst the most enterprising in the region, though a version of traditional beliefs – Modekngei – exists alongside the imported Christian beliefs. The political system is modelled on that of the USA, and Western culture is being assimilated - not least because of the many Palauans who continue their education abroad. However the traditional government still wields a lot of influence. Palau has two official languages – Palauan and English. The majority of residents speak both without difficulty. With around a third of the population consisting of migrants from the Philippines and their descendants, Tagalog is the fourth most-spoken language. Amongst older Palauans, Japanese is also spoken.